I've been discovering some hard truths about our industry lately, and realizing afresh how much we need the passion, handselling, creativity, and championship provided by our country's independent booksellers. They've been taking a hit, but New England alone still has over 350 indies! About a week ago, I started thinking: why not show them some author/illustrator love by planning a massive multi-author signing event? Great idea, right? So what did I do next? I twittered about it, of course, in 140 words or less. Fellow New England kid lit bloggers Sarah Rettger and AC Gaughen jumped into the conversation, adding fresh ideas. 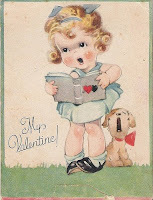 We decided on Valentine's Day 2009, envisioning that grandparents and parents could bundle up their kids, bring them to a bookstore between 10-noon, meet several authors and illustrators, and leave with a signed literary Valentine or two -- and a great memory. What came next? A website, of course. An invite to the honchos at NECBA and NEIBA, who responded with characteristic enthusiasm, and bookstores started signing up. Via Facebook, Deborah Sloan and Company agreed to show their support of the New England children's book community by providing PR pro bono. Authors like Ellen Wittlinger and Rachel Cohn jumped on board. A bookseller with a graphic arts background offered to design a poster and a logo. It's happening, people. Help! I have no idea what we're doing, but it's fun. Won't you join us on 2.14.09 by marking it on your calendar if you're a parent, aunt, uncle, or grandparent in New England, and signing up if you're an author or illustrator with a CBC-published book still in print? Fiction or non-fiction, anything goes. Here's the site if you want to spread the word: kidsheartauthors.com.